At Censalud, as a centre specialising in aesthetic medicine in Palma de Mallorca, we offer our clients the best treatments. 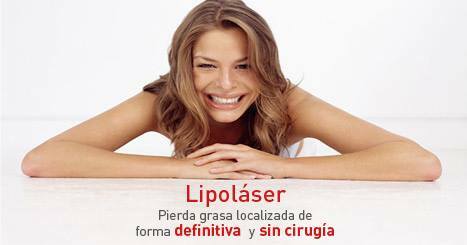 Among them the Lipolaser Mallorca, which is a technique that we apply to eliminate localized fat, reduce volume and improve flaccidity. It is equivalent to what liposuction would be, but without the trauma it causes. It is indicated for those people who, having a stable body weight, have at the same time an area that predominates over the others, whether it is the abdomen, cartridges, knees… It is in this area where we would pass the fiber of the laser to eliminate the fat and therefore the volume, and at the same time, thanks to the action of the laser, we would achieve an important reaffirmation of the tissue, correcting the flaccidity. With only one session, the result is definitive. That fat that we eliminate is not recovered again, since with the action of the laser we destroy it definitively. The main difference is that the lipolaser is much less aggressive. The fat is not broken manually, but the laser is introduced through a very small hole without producing any kind of trauma. The laser melts the fat and, the most important thing, is that with it we can fractionate the skin, in such a way that the fat that we consider necessary can be removed without fear of being flaccid. Another difference is that we can reach areas difficult to access with traditional liposuction is not possible, such as inner thigh, arms, double chin or pubis. Censalud has an experienced professional team, not in vain is one of the pioneering centers in aesthetic medicine on the island. It is directed by Dr María Isabel Caballero, a collaborating lecturer in the Master’s Degree in Aesthetic Medicine at the University of the Balearic Islands (UIB). We offer quality treatments, because the most important thing is always the health of our patients. And so we advise everyone who wants information for any of the treatments we carry out. The lipolaser is a technique to decrease the volume of localized fat and sagging. Not treating cellulite or obesity, is equivalent to what would be liposuction, but without the trauma caused by this, so it is indicated for those patients who have a stable body weight, more or less weight, there is a area predominates over the other, whether abdomen, love handles, knees, etc., in that area we would spend the fiber laser, achieving removal of fat and therefore volume, but at the same time, and also thanks to laser action an important restatement tissue, correcting possible sagging. It is done in one session and most importantly, the result is final. That fat is regained since we have destroyed and removed. What is the difference between a traditional liposuction and lipolaser? The lipolaser is less traumatic than traditional liposuction, it is done only under local anesthesia in the area to be treated, and the recovery and incorporation into work and social life is immediate. Virtually no pain or hematoma and the result is clearly visible within two weeks, although it will improve during the first month. In a traditional liposuction we must wait between two and six months. What are the Risks of lipolaser technique? Possible side effects is the bruising and slight pain then both disappear in a few days. Other possible, but rare side effects could be the occurrence of seroma, fibrosis … which are resolved in two or three weeks. It is new and unique in Baleares? It is not only new, but is exclusive (for now) in the Balearics. There are several lasers that produce lipolysis, but this type of Lipolase is a combination of two different laser energies producing a dilution of fat, truly melts first, and second causes significant skin retraction. This is what makes the difference with other types of lasers. It must take into account the different wavelengths, the difference in wattage that can have these lasers, which translates into the difference in results. We can observe a rapid loss of volume within 10-15 days and reaffirmation of tissue, also indicate little trauma involved, just local anesthesia and virtually no bruising. Can you make the lipolaser in people with flaccidity? and how is the skin after? Sagging is precisely one of the indications of Lipolaser. In areas such as the chin, the inner muscle and the arms often they have only large volume without sagging, by this technique, a very satisfactory result. What is the minimum age to become a lipolaser treatment? some form of parental permission is needed? It depends less on age, but of necessity. it is always better family consensus. What recovery time needed after a lipolaser? Incorporation is immediate, the same day or the next day, you can reinstate social life. The result at 15 days is visible both in reducing the volume and tissue retraction, but likewise is improving until after a month in which the result is optimum. You should wear a girdle for 10-15 days and do sports during that time, the normal life remaining. It is very aggressive about the steel cannula? Currently we have flexible fibers and a half a millimeter thick, which transmits an energy that produces destruction and dilution of localized fat which make your aspiration is very simple and not aggressive.